Four rowers have smashed a 114-year-old record by crossing the Atlantic in 43 days, 21 hours and 26 minutes. The Artemis North Atlantic Rowing Challenge crew left New York on 17 June and touched the quayside at St Mary’s [Scilly Isles] just before 1500 BST. The previous record, set in 1896 by Norwegians George Harbo and Frank Samuelson, stood at 55 days and 13 hours. Skipper Leven Brown told BBC News it was a “pell-mell, helter-skelter” trip. “It’s been absolutely amazing and what a reception we’ve here in the Scillies,” the 37-year-old from Edinburgh said. 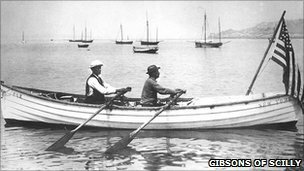 Rowing with the skipper were Ray Carroll, 33, from Galway in Ireland, Don Lennox, 41, from Lanarkshire and 39-year-old Livar Nystad from the Faroe Islands. Bravo! A world-class athletic feat – deserving every bit of recognition they receive. Was Marden Henge the builder’s yard for Stonehenge?